CIDRI and the IDM is also home to an innovative public engagement programme, Eh!woza, which aims to document the TB problem from within the community. Eh!woza developed through a collaboration between biomedical scientists, a conceptual artist, (Ed Young) and Ikamva Youth, a Khayelitsha-based educational NGO. Youth between 15 and 19 years of age, recruited from Ikamva Youth, are exposed to high impact biomedical research in a series of interactive science workshops. During subsequent media workshops youth are provided with the necessary skills and equipment to produce short films describing thoughts and attitudes towards HIV and TB in an area where the disease is endemic. Films are completely learner produced from conceptualisation through to filming and the final edit. The #UBUNTU group (Sikelela Qhashane, Alfa Wipaza, Xola Mfakadolo and Siphesihle Zimba, 16 – 19 years old) conducting an interview in the IDM labs during one of the Eh!woza science workshops. During this workshop learners were asked to design a research project based on some of the biomedical research topics that had been covered in previous workshops. While the project has been focussed on TB, community members often discuss issues related to HIV given the close association between the two diseases in this setting. In its most basic form, the project aims at decreasing stigma that surrounds both TB and HIV. The following reflection is an excerpt from the work of a social anthropology PhD candidate, Bianca Masuku. Bianca is investigating how knowledge about TB and health is configured within Eh!woza, and whether the project provides the space for youth to express lived experiences and the reality of TB and HIV within the township of Khayelitsha. After weeks of interacting with the science of TB, the students were asked to collect video footage of perceptions of the disease from communities of their choice, in and around their township. 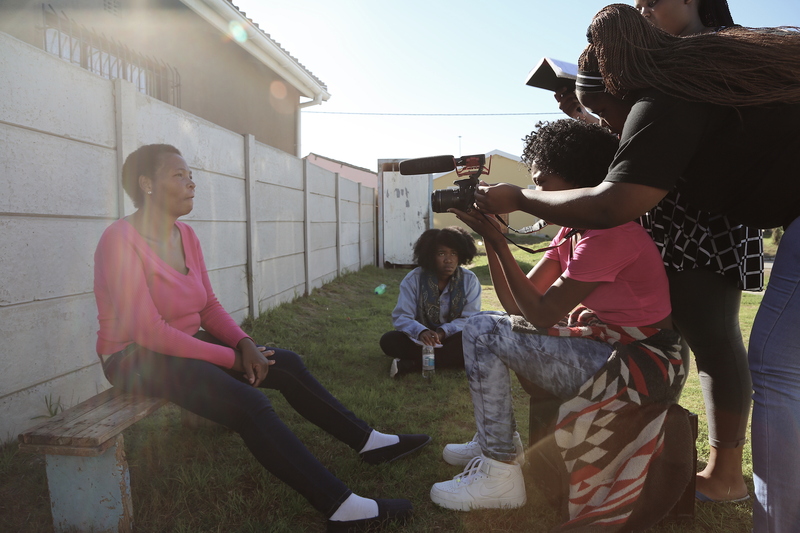 On the second day of filming, one of the group of students spent the afternoon in the neighbourhood of Makhaza in Khayelitsha in which they chose to create a story about Joyce, their neighbour. Joyce is an HIV positive mother in her thirties, who has previously suffered from TB and had recently suffered two strokes that affected her mobility on the right side of her body. We sat in the front yard, as the group set up the camera equipment for an interview with Joyce and her mother. 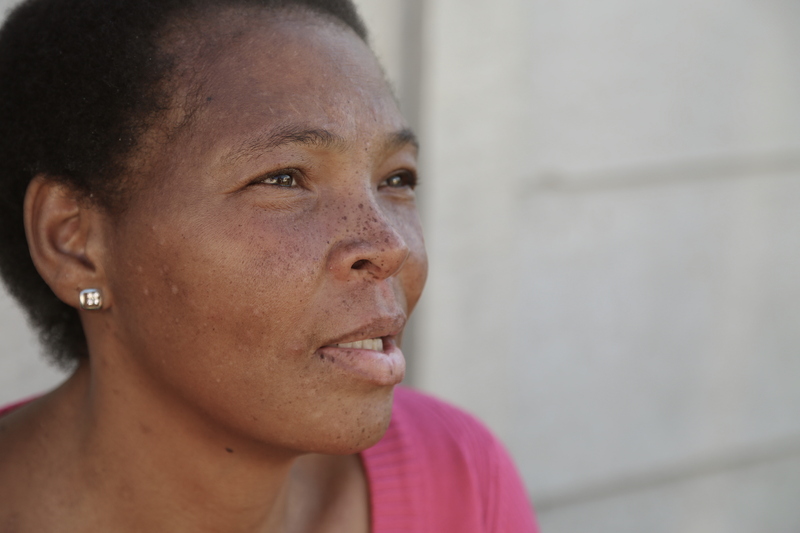 The filming began with reflections from Joyce’s mother about her daughter’s illnesses from the time of her infection with HIV to the point of her last stroke and how it affected her personally. She spoke in a soft voice, expressing how she was always there to support her daughter in her struggles. The interview quickly shifted to Joyce’s personal recollections of her illness experiences and, guided by the questions that the students asked her, Joyce provided a detailed account of how each experience with illness affected her life. When the students asked questions about the kinds of treatment that she was on, she stood up to fetch a bag in which she kept all her medication. As she spoke about her HIV treatment and how it had become an important part of her daily life, she removed multiple containers from her bag and described what each bottle was for and how she took the medication. Moments later, she suggested that we take a trip with her to her old house to visit family members that would provide better insight into her illness experiences and how she has managed to survive. Navigating through the very narrow spaces between the shacks, we were greeted by many people that knew Joyce very well. We passed in a small tavern with people conversing loudly amongst themselves while sharing a few beers. Two family members were seated outside her old home in a part of the township called TR Section. They were startled by the camera but happy to see Joyce. They welcomed us in and agreed to share their stories of Joyce and her struggles with her illnesses. Their descriptions were detailed and, at many moments, extremely emotional, with each family member expressing how Joyce’s illness affected them personally and economically. In their accounts, they spoke of their own illnesses, having suffered from TB as well and currently struggling with ARV treatment for their HIV status. Films from the project can be viewed on Eh!woza’s website or Facebook page.